In January 2018, ELN announced, through staking, the acquisition of 100% of three gold projects in the Great Northern Peninsula of Newfoundland. The claims were staked to follow up on the new Gunner Cove gold discovery of White Metal Resources. The Murray Brook Project is the largest NI43-101 compliant mineral resources in the Bathurst Mining Camp. Murray Brook is a joint venture project owned 32.5% by ELN and 67.5% by Votorantim Metals Canada (VMC), the Canadian subsidiary of Votorantim (2nd largest mineral resource company in Brazil, with business interests in more than 20 countries). VMC is the Project Operator. To date, ELN has invested approximately $3.5 million in exploration expenditures since 2010. In 2011, ELN and VMC spent $2.1 million on exploration and completed 10,000 metres of drilling. Drill results formed the basis of the first NI43-101 compliant mineral resource estimation for the Murray Brook deposit, which was announced on February 28, 2012. The exploration and development program for 2012 consisted of an additional 18,500 meters of drilling on the Murray Brook deposit, metallurgical studies of drill core material from the deposit, and exploration on the adjacent Camel Back property, which is included in the Murray Brook Joint Venture. VMC and ELN released a positive Preliminary Economic Assessment (PEA or Scoping Study) in June 2013. The PEA was prepared by P&E Mining Consultants Inc., a leading independent consulting firm based in Brampton, Ontario. The results (see Table 1 below) demonstrate the potential technical and economic viability of establishing a new open pit mine and mill complex on the Murray Brook property. The financial summary is based on a mill throughput of 6000 tonnes of ore per day (or 2Mt/year) and a Life of Mine of 9.5 years. PPI - The Policy Potential Index is a composite index that captures the opinions of managers and executives on the effects of policies in jurisdictions with which they are familiar. The PPI is based on ranks and is calculated so that the maximum scores are 100. Each jurisdiction is ranked in each policy area based on the percentage of respondents who judge that the policy factor in question "encourages investment." 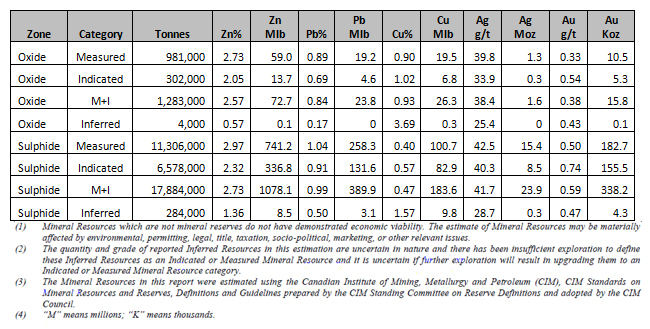 The PEA is based on an updated NI 43-101 Mineral Resource Estimation (see Table 2 below). * Murray Brook's 2013 PEA is preliminary in nature and its mineable tonnage includes Inferred Mineral Resources that are considered too speculative geologically to have the economic considerations applied to them that would enable them to be categorized as mineral reserves and there is no certainty that the preliminary assessment will be realized. Mineral Resources that are not mineral reserves do not have demonstrated economic viability. 3-year trailing average metal prices (US$) as of January 31, 2013: Copper $3.68/lb, Lead $1/lb, Zinc $0.95/lb, Gold $1500/oz, Silver $29/oz. ELN signed an option to purchase agreement regarding the sale of its interest on this project (News Release: Oct 13th, 2016) with Puma Explorations for $3.1 million dollars, Recent revisions (News Release: Nov 6th, 2017) with regard to the Puma Exploration deal has the second payment from Puma of $1,500,000 due for May 10th, 2018. The 3rd and final payment of an additional 1 million (total 3.1 million) is due by April 30 2019. In addition, a royalty for the life of the project will be paid to ELN as per spelled out in the agreement (News Release: Oct 13th, 2016). In the event Puma does not complete it option to acquire ELN s interest ELN will receive its entire interest in the Murray Brook project back.